Hi everyone. Day 1 of the on-line watercolor class had three different watercolored background techniques for us to try. I have to say that I failed miserably at all of them. Everything from my first four hours went into the garbage and saying I was disappointed was an understatement. I know that watercoloring is an extremely difficult art form. I believe it takes a lot of practice to understand how the water and paints react to the watercolor paper. I have only had limited interaction with this medium, and I have always used inks, not watercolor paints, so I decided that after many failures, I would try to replicate the techniques shown, but used inks and came up with my own procedure. This is the first background, and I'm relatively happy with how it turned out once I switched to inks. The colors are more vibrant ... but I couldn't get the stencil to show as much as I'd like - it's a work in progress. I will keep experimenting. And I will also try the technique as shown in class today - I'll keep practicing and hope that I get the hang of watercolor paints. I'm entering this card into the Simon Says - Anything Goes challenge. This card is fantastic!! My hubby is a water colour painter, so he's given me some tips but it is a very hard medium to work with for sure!! Loll, I've only watched the preclass video, explaining supplies, etc. Haven't had time to see the class stuff just yet Maybe tomorrow. I struggle with all the different types of W/C I've ever tried. H2O's, DI, markers, Art Impression techniques with ink pads, you name it, I've failed at it! I love this card, and the subtle lattice of the stencil looks pretty good to me! I'd love to see what you threw in the trash too! Bet it's a lot better than you think. (at least you can show us what failed! I learn a lot from my own failure & hope others will too when I share it. I also learn a lot from what other crafters call 'failure', that looks pretty good to me! It's inspiring to know I'm not the only one who struggles!) This is really very pretty and I like that you put your own touches to it, so TFS & Hugs. Loll, you did a fantastic job and I bet the others you threw away were great also. I like the fact that you used SU inks and not the norm of the Distress Inks, pat on the back, job well done, thanks for having the guts to share your creation with the world, you've inspired me. I love your card! I also had to modify the techniques they showed on the videos to get something I liked. Keep up the good work! You may think that your first attempts were a disaster and you may think that you failed, but I personally would love to see them, since what you have come up with is fabulous! Love the colours and the effect of the template that you have used. Looking forward to seeing more. I think you were smart to go with your inks on this card, Loll! I'm totally frustrated over here, and still haven't completed one project! 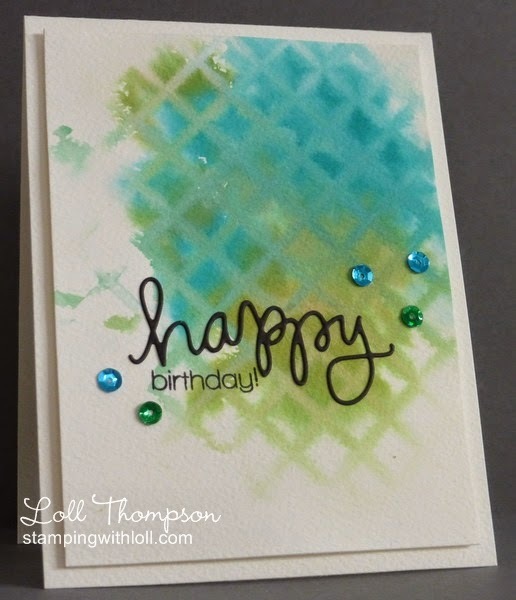 Your lattice background and choice of inks really makes this card shine...I love it! And, I'll bet you'll be a pro at water coloring in no time, too! Beautiful CAS card. Love the design and colors. Beautiful! Your card stands out in the gallery! I really like how this came out! I need to take a watercolor class! What fun - I am so impressed you found a way to make it work (but knowing you, I am guessing most of us would have loved all your attempts). Fun!!!! Hugz! How cool is this?! A great card Loll - watercolours are very difficult to work with so I've stuck with my DI's!! Thank you, Loll. I did the first card and couldn't get the stencil to come out. I did the second card 4 times before I got one I liked. So I threw away several cards and thought I just wasn't cut out for watercolor! I kept at it and finally produced two cards. Then - I couldn't upload them for some reason! Your inked card is really pretty, I think it came out great. I failed at this technique also! Yours turned out great gives me hope! i only had some luck with this stencil technique when i used my distress inks - just using watercolors didn't work after several attempts - am glad it wasn't just me - anyway your card turned out very to be very pretty - i did mine in blues and greens too but have yet to finish it. Gorgeous card!! Such a beautiful design!! Love the background!! This is such a beauty :) I love the colors, water coloring indeed is difficult, I hardly try doing it, but I am pretty sure u will succeed. I'm with you on the inks-v-paints issue, Loll. Never tried SU inks but I find Memento inks soak in too quickly which is why I prefer distress inks - they lie on the paper long enough for you to play around with them - and I also like that you can spritz them. This card is fabulous, by the way!